Paul Stamets, lead author of the study and founder of Fungi Perfecti, a business focused on promoting the cultivation of mushrooms, told ABC News that he worked with researchers from Washington State University and the U.S. Department of Agriculture on the study. “This is a natural product and [it’s showing] tremendous results in reducing the viruses of bees,” Stamets said, noting that the mushrooms are “the first antivirals to reduce viruses in bees. Published by Nature Scientific Reports, the results of the study noted that over the last decade, while the demand for honey bees has increased, the annual colony losses have continued to increase, usually by more than 30 percent each year. 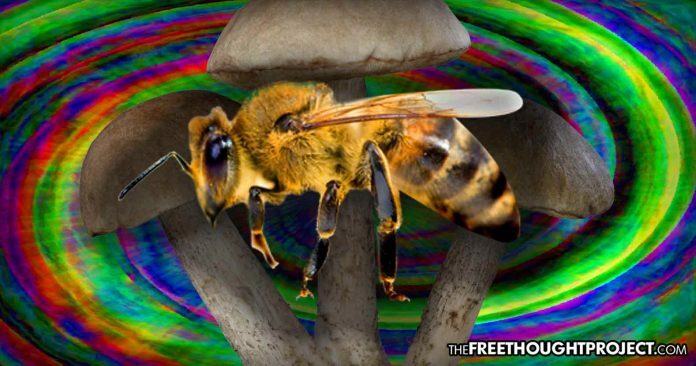 The power of mushrooms is now having the same effect on fragile honey bees, and the study found that the extracts could almost double the lifespan of caged bees while simultaneously working to reduces their viral count. One of the most incredible things about this study is that the researchers took the time to pay attention to the elements in nature that honey bees were attracted to, and they found that the bees were instinctively foraging for a substance that helped to protect them. The study is also yet another “win” for magic mushrooms, and as The Free Thought Project has reported over the years, there is no shortage of wonders that come from mushrooms, which include treatment for depression, opioid addiction, PTSD, and mental illness—just to name a few.